Revealed to be a Decepticon sleeper agent, Brainstorm is now loose in the time stream! But what kind of damage does he intend to do four million years in the past? Just what did he do to everyone at Swerve’s bar? And is Trailbreaker Trailcutter really dead or was that just a particularly graphic JRo fakeout? 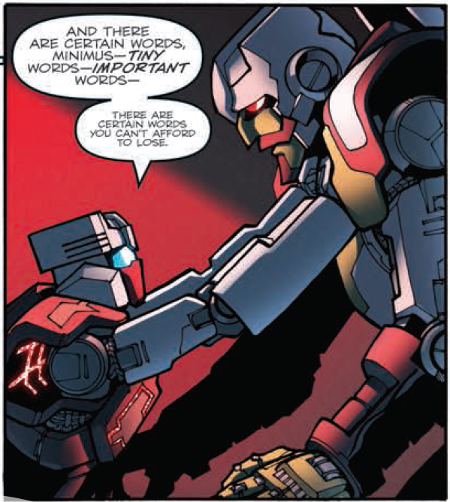 But while MTMTE #35 answers all those questions, they aren’t the core of the issue. Just like the last two, this issue is split into the present day story and “Shadowplay”-style flashbacks — but with a twist. This time we get a tale of Rewind and the Brothers Ambus in a terrible history present that may yet come to pass if Brainstorm isn’t stopped. 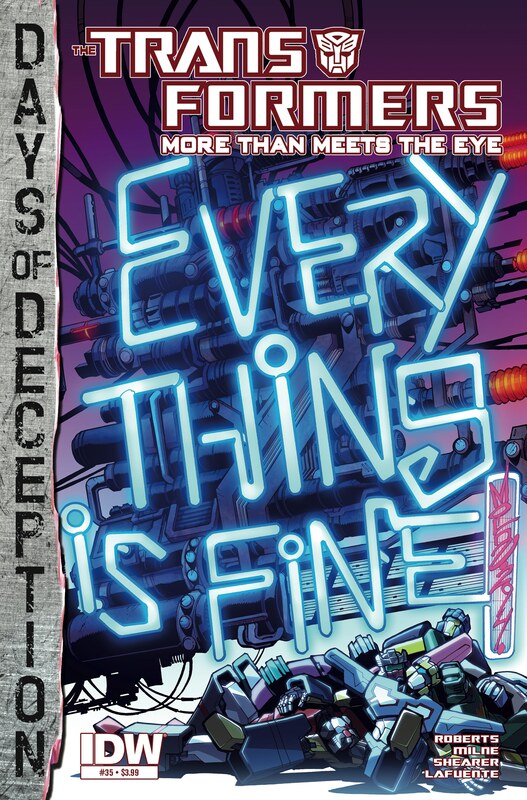 Alex Milne is back and Everything Is Fine as we jump into More Than Meets The Eye #35! MTMTE has been running at a slow burn since Dark Cybertron, and that continues here. It’s not that James Roberts has fallen into the awful modern-day habit of super-decompressed storytelling — one only has to look at this week’s other release, Drift: Empire of Stone, to see what actual super-decompressed storytelling looks like — but the series has taken its time lingering with characters, some old, mostly new. Every story has been a great one that deserves to be told, but the overall impression is of glacial movement. This continues in #35, where not much happens but what does happen is spread across a lot of characters and a great deal is established and revealed – which for my money is more interesting than happening anyway. The issue starts off with a flashback. And it seems innocuous enough, with Rewind meeting his brother-in-law Minimus Ambus at the spaceport where he’s returning from a deployment with the Primal Vanguard. (Go on, get that gay robot in-laws squeeing out of your system now. Better? Let’s continue.) Minimum has been gone for a couple million years, and in the meantime a lot has changed on Cybertron. The Functionists are firmly in control, the “knock-offs” have been deported, Luna 2 has been sold for raw materials, and the Functionist Council has begun “recalls” for those with “obsolete” alt-modes that amount to alt-mode-based genocide. Just as you start to realize this is way worse than any actual Cybertronian history that’s been established, Chromedome tears his way into Rewind’s room because he heard Rewind having a nightmare. And let’s take a moment to appreciate the characterization here, because there were some (myself not among them) who were worried Chromedome and Rewind were going to go back to being all Happy Gay Robot OTP Time. (Like their relationship was ever entirely without conflict, c’mon.) Chromedome, poor self-deluding guy that he is, also seems to have thought they were going to go back to being all Happy Gay Robot OTP Time. But the pair serves their meta-roles perfectly here: Chromedome, the embodiment of Forgetting, just wants to pretend nothing since the other Rewind’s death ever happened, but Rewind, the embodiment of Remembering, can’t let go of what happened to both the other Chromedome and the other Rewind. Rewind wants to take things slow, but Chromedome is in such a hurry to patch things over, to forget, that he gave Rewind one of the other Rewind’s souvenirs from Hedonia without even thinking that this Rewind was never even there. It’s more than a little heartbreaking for both of them. But that nagging feeling that there was something terribly wrong with that flashback is confirmed, because Chromedome points out that the awful things Rewind was remembering in his nightmare, things that are recorded in his database, never actually happened. There’s an important timeline note to make here, too: Chromedome points out that the date Rewind remembers this happening on was about half a million years ago. Chromedome remembers them already together then (and working with a laser pointer with the *cough*brilliant*cough* name Shimmerstick), but Rewind was still with Dominus Ambus in the memory. Brainstorm went back four million years. So the story in this flashback is not necessarily the intended or even necessarily a direct result of what Brainstorm is doing mucking about in the time stream. These are the ripples, intended or not, three and a half four million years later. And along with everything else, whatever originally caused Dominus to disappear no longer happened. So scribble that into your crazy Dominus Ambus fan-theories. UPDATE: The TFWiki page on the issue points out that this isn’t a flashback at all – it’s the present! The half-a-million-years only refers to when the laser pointers were recalled, which Lost Light-Rewind was having a flashback to but which Cybertron-Rewind did say happened “ages ago”. I misread the Cybertron story as being Rewind’s bad-dream flashback — My bad! You may now return to your regularly scheduled crazy Dominus Ambus fan-theories. 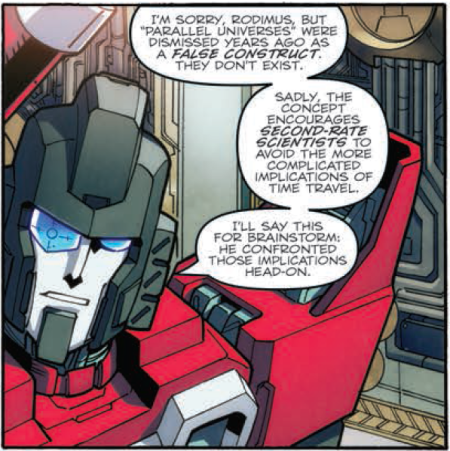 Rodimus explains that everyone was knocked unconscious for two reasons: Brainstorm was spiking Swerve’s engex supply with a remote-activated toxin, but it failed to kill them because Swerve dilutes his drinks. Very cute. Meanwhile in the altered past, Rewind reveals to Minimus that Dominus has become the victim of an advanced and particularly awful form of Empurata. His head and voice have both been removed, replaced with a monitor-head that displays his speech in text occasionally interrupted by Functionist propaganda pop-ups. But just as interesting to us is the video footage Rewind shows Minimus of an anti-Functionist protester throwing her transformation cog at a Council lackey. Yes, her. It seems that Brainstorm did an awful lot of tinkering with things in the past, including introducing gender to Cybertronian society — and specifically to Rung! In that one little almost-aside, we’re reminded just how much poor Rung the Ornament would suffer under a hyper-Functionist government and shown that he could have been a she. The idea some of that our default-male characters might have been female if they had been aware of the option has been played with before, but that was a really fun touch. Shame about the Functionists. The Functionists who have just decided to recall the data slugs. Well crap. With Nightbeat holding on to a duplicate briefcase, the Lost Light’s fearless leaders are ready to give chase. Brainstorm went back four million years, right? 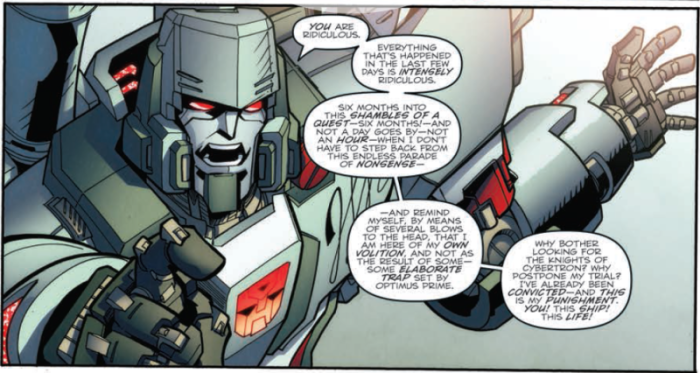 Megatron says Brainstorm’s goal is obvious: To kill Orion Pax. So was letting the Functionists take over part of the plan? As a scientist/engineer with an aerial altmode, Brainstorm isn’t exactly a Functionist poster child, so it seems more likely an untended consequence of taking Orion Pax out of the equation. Introducing gender, though? That was more likely intentional. And hey, we can all agree more Cybertronians should be like Nautica. You misread a lot of this issue.